Please refer to our stock # TC271 when inquiring. 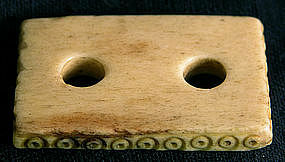 All along the four edges of this bone toggle, there is a carved circular pattern design. This pattern is very similiar to a Yao Ethnic Minority pattern and would be unusual in a Han piece. The last picture enlargement shows how the toggle would have been used to secure the cords of a hat. The bead would be moved up the cords so that the toggle would be tight under the chin. This system would hold the hat on the head while miniumizing preasure and discomfort to the skin. Visible in the pictures 1 and 2, there is a tiny chip missing from long ago on one side at the edge of the hole. The toggle is 1.75 x 1 x .25 inches and is worn very smooth from use.